\"Its a good initiative by the government. Satellite towns around these smart cities will be good opportunity for the real estate development especially affordable housing.\"
Urban Development Minister M Venkaiah Naidu announced the first list of 20 cities today that will be developed to have basic infrastructure on Thursday. Realtors' body CREDAI on Thursday hailed the selection of first 20 cities for 'Smart City' programme, saying the initiative would provide great opportunity for the real estate development, particularly in the affordable home segment, with improvement in infrastructure of these towns. "Its a good initiative by the government. Satellite towns around these smart cities will be good opportunity for the real estate development especially affordable housing," CREDAI President Getamber Anand said. Welcoming this step, CBRE South Asia Chairman & MD Anshuman Magazine said: "While this initiative will involve large-scale retrofitting as well as redevelopment; these cities could become showcases of urban infrastructure development, encouraging others to follow suit." Cushman & Wakefield MD Sanjay Dutt said the Smart City initiative would further boost the affordable housing, which is already a priority for the government. The Smart City initiative would be a game changer in raising the standard of infrastructure in the cities in the country, said Shubhranshu Pani, MD - Infrastructure Services, JLL India. "Adequate attention is paid to sustainability, infrastructure and improving the life of inhabitants," he said, adding that JLL has supported two of the cities which have been shortlisted in the first list -- namely Bhubaneshwar and Chennai. CREDAI Western UP Vice President Amit Modi said the smart city would greatly enhance the much needed infrastructure requirement of these cities. Pune Real estate sector will be impacted positively with an impetus to the infrastructure growth as well as the economic activity for Maharashtra, said Rohit Gera, MD of Pune-based Gera Developments. 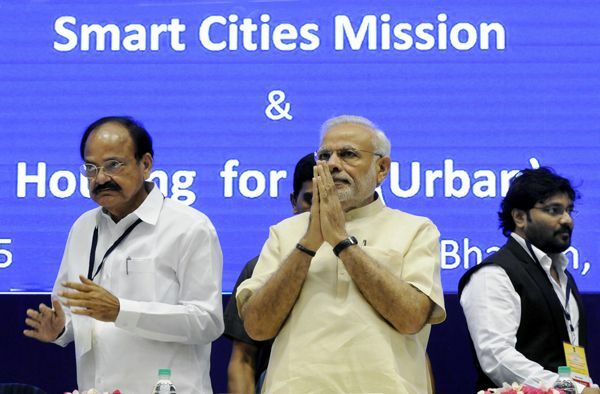 Bhubaneswar emerged on top among 20 cities, including Pune, Ahmedabad, Chennai and Bhopal, that have been selected as part of the first batch of the Smart City initiative for which the NDMC area of Delhi has also made the grade. Urban Development Minister M Venkaiah Naidu announced the first list of 20 cities today that will be developed to have basic infrastructure. Assured water and power supply, sanitation and solid waste management systems, efficient urban mobility and public transportation, IT connectivity, e-governance and citizen participation are some of the highlights of the initiative. Jaipur, Surat, Kochi, Jabalpur, Visakhapatnam, Solapur, Davanagere, Indore, Coimbatore, Kakinada, Belagavi, Udaipur, Guwahati and Ludhiana are the other cities selected in the first batch.